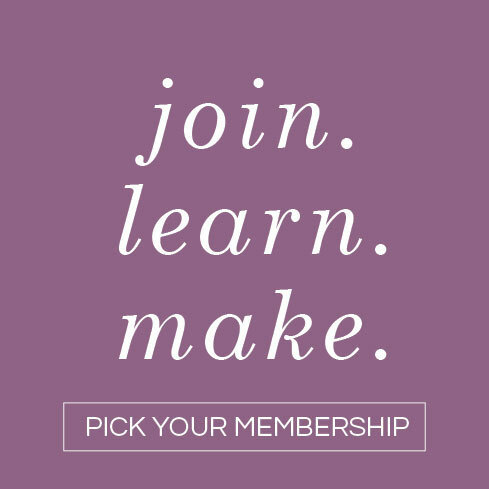 We always welcome any project requests or suggestions from our members. You are a huge part of our creative process, plus you tend to have brilliant ideas. Exhibit A: flowing paper wisteria vines! 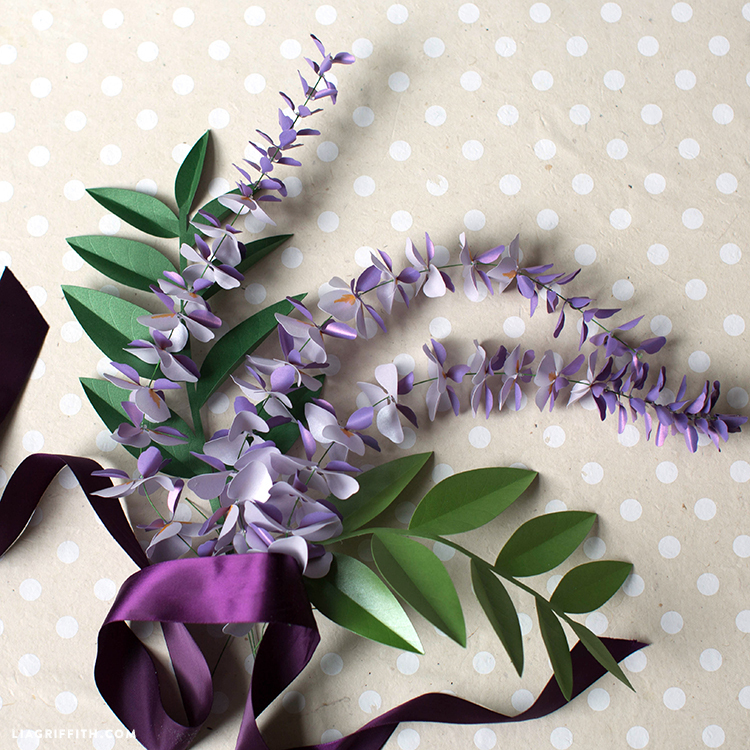 Wisteria is a gorgeous flowering plant that grows in an intriguingly soft purple shade, so of course we loved the idea of making a paper tutorial when one our our readers suggested it. 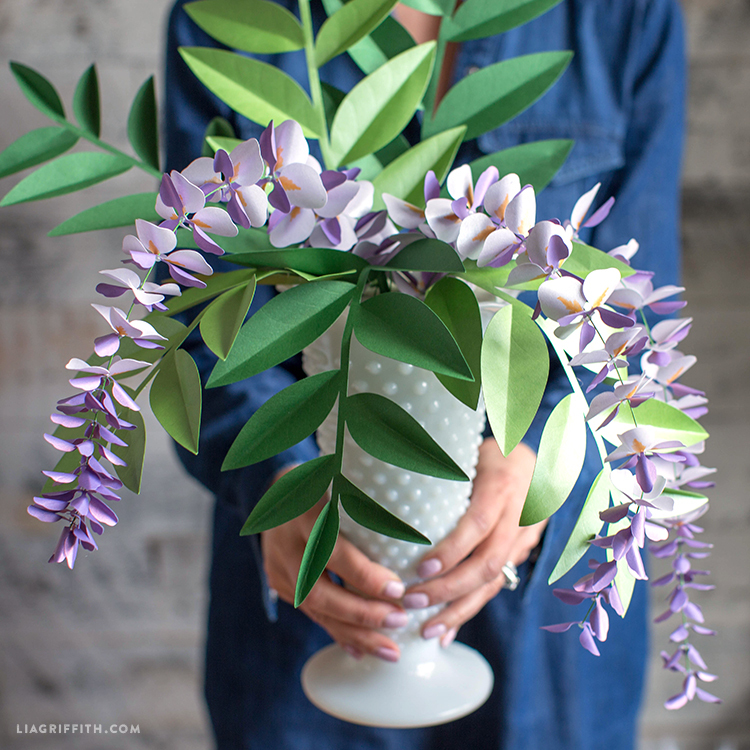 It may seem a bit daunting at first because wisteria has so many little petals (a cutting machine will definitely come in handy for this one), but the process is simple and the result is stunning. We teamed up with our friends at Paper-Papers to use the best paper possible in bringing these to life! Cut the petals according to the SVG or PDF template at the bottom of this post. Punch a hole in the middle of each petal. Color a fan shape on one side of the lilac colored petals. Using the edge of your scissors, curl all of the petals in the same direction, curl the lilac colored petals on the side that was not colored. Using a small paintbrush, put a dab of Yes! Paste in the center of the lilac petals on the side that is colored, glue the violet petal in the corresponding size to the lilac petal so they curl away from each other. Place a small dot of hot glue on the end of the wire and slide a small violet petal facing down on top of the glue dot to hold it in place. Repeat this 6 times, spacing them about a 1/2″ apart. 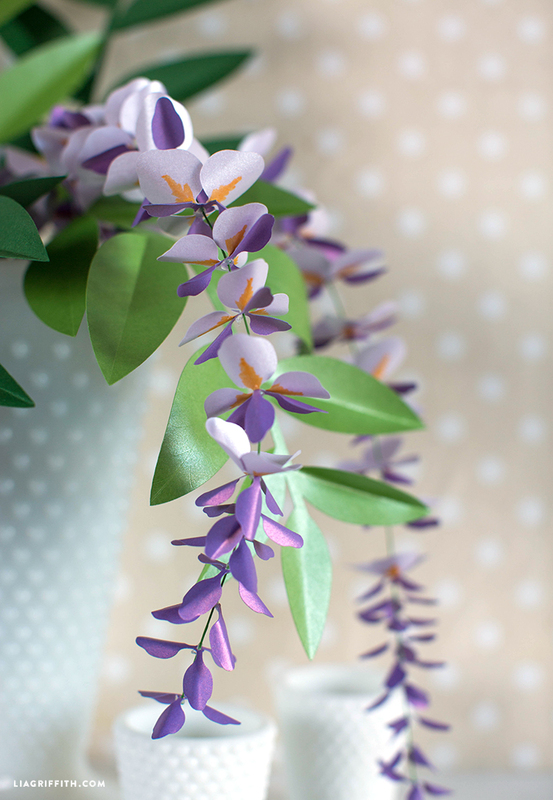 Glue 4 small flowers onto the wire with violet petals facing down and spacing them about a 1/2″ apart. Glue 4 more medium sized flowers onto the wire, increasing the spacing to 3/4″ apart. Glue the last 4 largest flowers onto the wire, spacing them 1″ apart. Using the hot glue gun, glue a wire down the center stem of the leaves. Use the edge of the scissors to score along the score marks and curl the leaves. 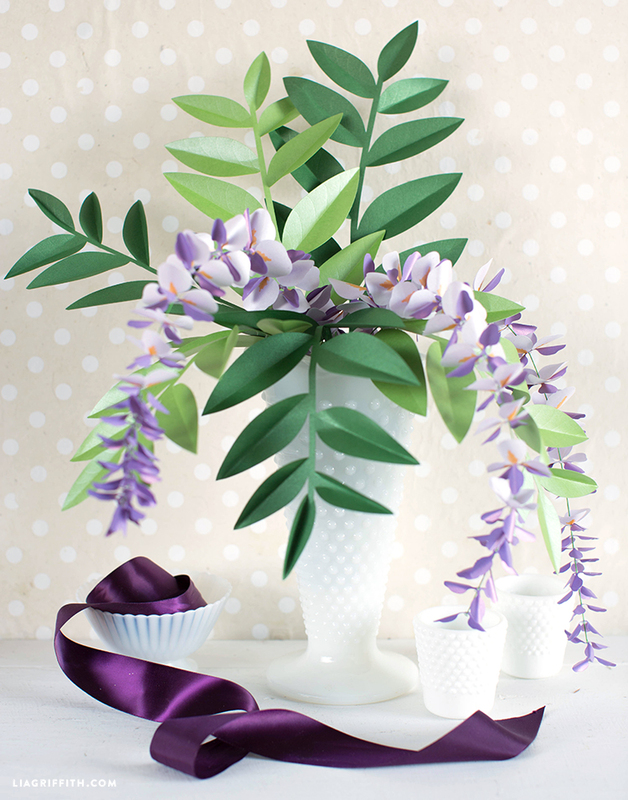 Head over to Paper-Papers blog to follow along with our photo tutorial for this paper wisteria! 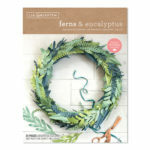 We have both an SVG and PDF version of the template, so you can make these wisteria vines with a cutting machine or cutting by hand. Next, gather your papers. 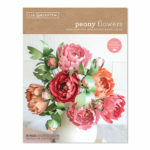 Unlike other paper flower projects, we used Yes! Paste for gluing the petals together because it dries much more quickly than other glues. Once you start adding the flower to the wire, you will want to switch over to hot glue. When stringing the flowers to the wire, we recommend adding the dot of glue under the flower so that it is hidden. 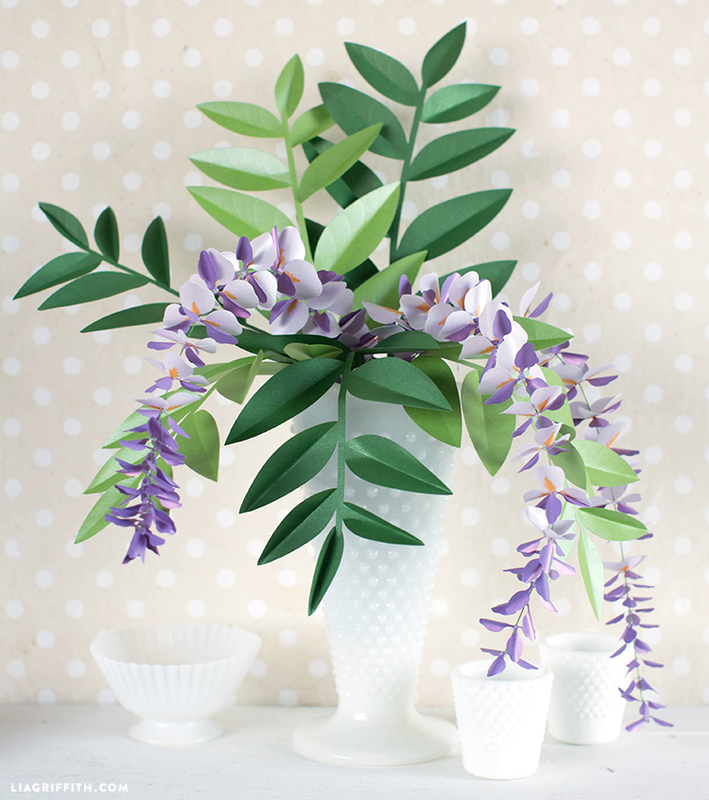 After you finish your paper wisteria vines, you can make a bouquet, turn them into a potted plant or hang individual strands as beautiful decor! It looks like a real flower. It is a beautiful flower. How many flowers would the paper bundle make? They are beautiful! Thank you, Jill! For each flower strand, you will need 1 piece of lilac and 1 pieces of violet paper, and you can get 1 leaf from 1 sheet of paper. Thank you! I love how these turned out. 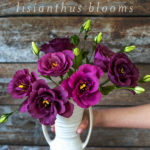 Hello Lia and team- every day I enjoy your newsletter, all these beautiful things!!! Thank you for your sweet comment, Martina. We appreciate you following along, and sharing your creativity with your own community! I love your paper flowers!! They were the reason I got the subscription in the first place! 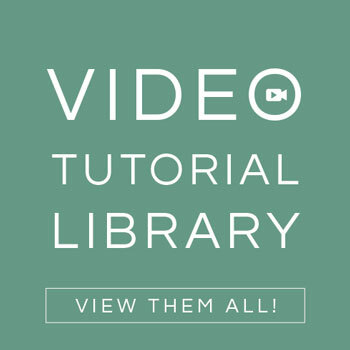 Is there a .svg file for the leaves? what about a template for the white ones-with the yellow on them? Ok. They are done. I (as usual) made them,in my head, a lot scarier than they were! Mistakes on the first one, but just put that one in the back. Nobody will be the wiser. Thank you for all your patience, and encouragemant!!! Yay! I’m so happy to hear this. 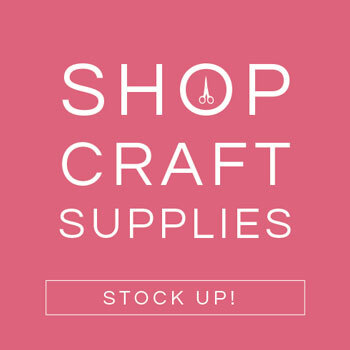 We’d love to see a photo– you can email it to hello@liagriffith.com, or post it to our Facebook page.